The film opens with Django (Jamie Foxx) marching with a group of slaves led by two Slavers, marching from a slave auction. The group comes across Dr. King Schultz (Christoph Waltz), a German Dentist. He has been looking for the group in the hopes of acquiring Django. He hopes Django will be able to assist him in tracking down a group of brothers. Schultz manages to free Django, and the pair go off to find the Speck Brothers, former owners of Django’s. It turns out Schultz hasn’t practiced Dentistry in 5 years, and is working as a Bounty Hunter. The pair hit it off quickly, as Django reveals he has some talents in the bounty hunting arena. As the pair becomes closer, Django talks about his wife, Broomhilda (Kerry Washington), who he was separated from as the result of their cruel previous owner. They track Broomhilda to Plantation owner Calvin Candie (Leonardo DiCpario), who’s hobby entails having male slaves fight for sport. Unlike Basterd’s somewhat fragmented style of storytelling, Django plays out like a traditional narrative. The film is equally if not even more brutal than Basterd’s, and has quite a few extremely violent sequences. However, at times, some of the violence is so over the top (one scene has the walls literally painted red), that it almost softens the intensity of it. Tarantino knows exactly how to use Waltz, the role of Schultz is tailor made for him. Leonardo DiCaprio is stand out per usual, this time playing a villain, a role he’s never been in before. Despite that, he does it well, he’s equal as charming as he is brutal. Jamie Foxx plays Django as a quiet, cunning hero, whose intelligence and character grow into what crescendo’s to an excellent conclusion. While only somewhat grounded in reality, Tarantino wasn’t setting out to give us an accurate period film, but the film does show us the brutality of slavery. There are some gut wrenching realities throughout Django, and Tarantino doesn’t try to sugar coat it. It’s a period of time where people did awful things to others, and the message comes across clearly. Robert Richardson’s spaghetti western meets 70s pulp film cinematography was excellent. The film features quite a collection of original works of music, including some from Ennio Morricone (best known for his Sergio Leone scores). There were a few modern sounding tracks that surprised me, but, it fit with the film’s tone. 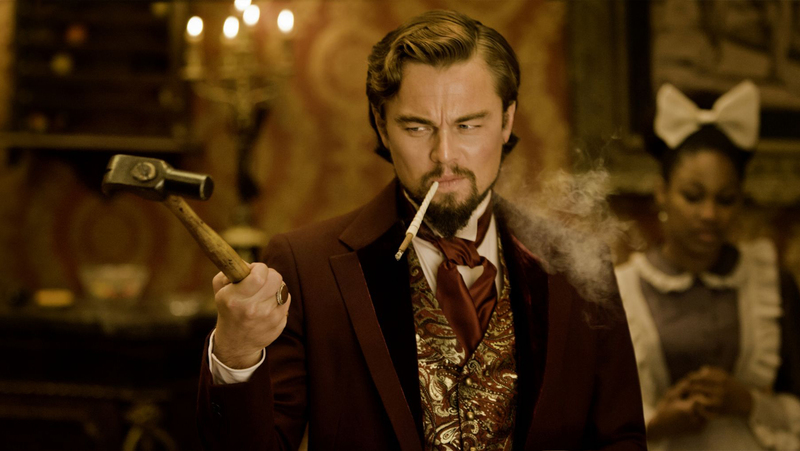 With Django Unchained, Tarantino once again proves that he’s a great story teller, and one not without controversy. I trust that will see a slew of more nominations this Awards season, and it’s definitely one not to miss.